I bought my first purposeful audio recorder, a simple handheld Sony cassette device, a week after completing Naropa’s Summer Writing Program in 1986—planning to use it as a composition tool, to “compose on the tongue” in Ginsbergian terms. Ginsberg described, in one of our classes, his successes and failures in using a recorder to “write” [see his Composed on the Tongue, Grey Fox (1980) for some discussion of his practice in this area]. His notion, writing-by-dictation, seemed compelling: I was about to embark on my first cross-country road trip so I imagined imparting my own observation dictations à la Fall of America. Little of substance came from that experiment, though I later ended up using that recorder to document some readings and band rehearsals; quality of these tapes, which I still have, is not good—this was rudimentary recording tech and cheap cassettes barely sustaining documentation. Once I began organizing events that seemed important enough to preserve on tape (with We Press, see “in audio practice II’), circa 1989, I have done whatever possible to document literary and artistic activities I’ve experienced with a tape deck or camera. The “Rip-A-Day” project provides an overview of my surroundings as a writer and musician, stemming from the subcultures I was immersed in; first, in Santa Cruz, as a non-academic performance poet and publisher, then as a graduate student in Albany, NY, and now as a professor of digital poetics in New Jersey. Such documentation has been central, and crucial, to my practice as a researcher and as an artist. Readings, performances, and people in place are ephemeral; they can be powerful and inspirational, but memory and rapidly written notes are often inexact and imperfect. Having an audio chronicle of what transpires in literary occasions sustains involvement with the text, and sometimes doubles by serving as “art supplies”. Further, as a musician and multimedia artist, sound often plays a primary role in my performances and installations. I see everything recorded as a potentially creative and, finally, a critically important task—a documentary form that preserves and circulates texts for others to hear. In 2010, Charles Bernstein, aware of my penchant to make field (and other types of) recordings, invited me to be a Senior Editor at PennSound—presumably as a way to encourage me to begin preparing some of these recordings for the archive. I have, in subsequent years, supplied dozens—though at this juncture there remain hundreds more. 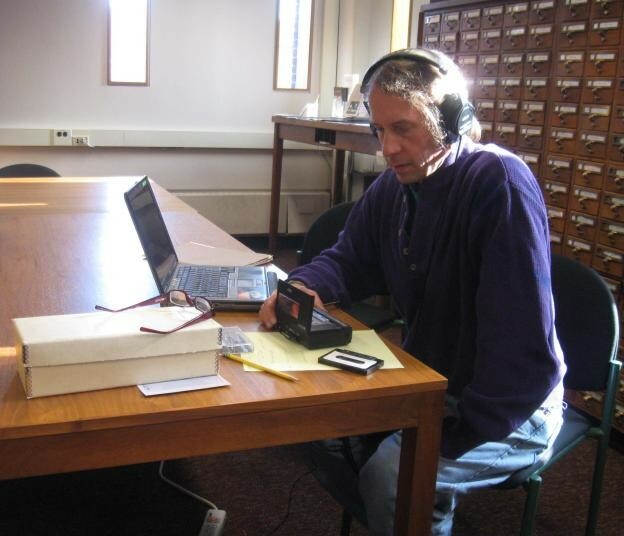 Now, as a contribution to National Poetry Month 2014—as always playing the role of scholar, artist, and technician—I retrieve nearly fifty recordings I’ve either made or collected, for presentation on either PennSound or the We Press SoundBox archive. The We Press SoundBox is an outgrowth of an extensive project I created in 2013 for the Electronic Literature Organization’s “Chercher le Text” festival in Paris, where I produced a work titled Funk’s SoundBox 2012 that unites more than 400 recordings I made in 2012. Subsequently I created an archival SoundBox. My weekly commentaries are based in personal experience and interest, and I hope they encourage others to capture things they hear and cultivate their own micro-communities through sound. I have little to say about audio poetics in general, other than I am glad that I chose this route, to possess the recordings and to have them to share with others. I am always astonished when conference/festival/reading organizers do not document events they produce. I encourage everyone to record activities of interest (for future reference), to create their own sound annotated libraries, and network with other archivists!